The temperature just seems to keep rising and falling and once again the week started with some very chilly mornings. On one morning, our walk took us past the lake where we stopped to see the birds all standing on the frozen water. We talked about why parts of the lake were frozen whilst other parts weren’t and watched the birds slipping and sliding as they tried to walk and land on the slippery ice. The following day we had our own opportunities to slip and slide on ice as we walked into the forest and found lots of frozen puddles. We cracked the ice under our feet, enjoying the sound it made, and watched the ice disappear into the puddles below. We picked up pieces of ice and saw all the bubbles trapped inside and found frost on the grass and fallen leaves. We talked about how they looked like they had been traced with a pen, outlining all the main features and skeleton of the leaf. We also found some muddy puddles that weren’t frozen and discussed why this might be. One of the children said it was because there was too much water and then informed us that water can melt ice (even cold water). What fabulous opportunities we have to see the changing seasons around us every day and really understand how things work and why things happen. To stay warm in the forest, we had running races where we timed how long it took the children to run to the log, around the log and back. The children were eager to hear their times and find out who was the fastest. It was nice to see them wanting another turn to try and beat the fastest time. A great way to get warm and develop their coordination and spatial awareness at the same time. Of course, they challenged the educators to see if they could run as fast as them and cheered as we raced up and down the forest too. 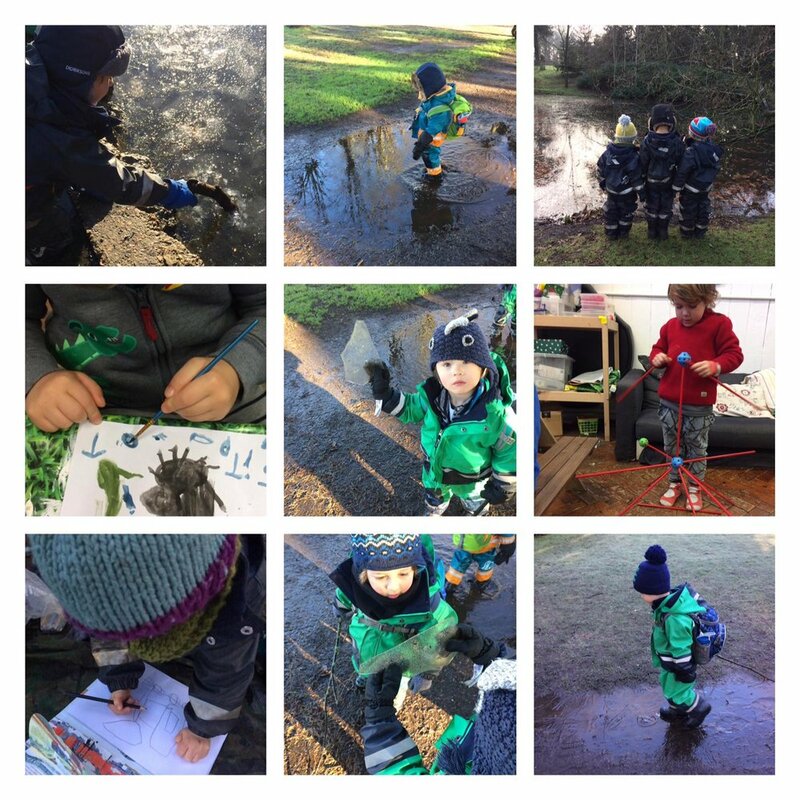 Despite some very cold weather, it is nice to see that with the right layers the children are playing and exploring happily and constantly on the move. Lovely friendships are evident each day and the children have been playing so nicely together in the forest since being back after the Christmas break. The forest abounds with endless imagination and they chatter as they negotiate their play, moving from place to place with purpose. The weather forecast is promising more snow so we are keeping our fingers crossed that we might get the chance to build some snow people soon! We hope you all have had a fantastic weekend and cannot wait to see what adventures next week brings!